Annual effective dose of gamma emitters in infants, children and adults for frozen chicken samples consumed in Iraq. Department of Physics, Faculty of Science, University of Kufa, Iraq. University of Kufa, Najaf, Iraq. This work was directed towards finding out the natural radioactivity and effective dose due to ingestion of frozen chicken samples that are created regionally and foreign from outside Iraq taking in account different age groups. The samples were collected from markets in Al-Najaf city. This food analyzed in the laboratory using gamma spectrometer. The average of specific activity of 40K, 226Ra and 232Th of the samples under study were found to be 65.40±11.14 Bq/ kg, 4.53±0.89 Bq/kg and 0.87±0.19 Bq/kg respectively. These results were less than the worldwide vary for 40K, 226Ra and 232Th in food according to UNSEAR 2000 that it's four hundred Bq/kg, thirty Bq/kg and thirty two Bq/kg, respectively. While the average total value of annual effective dose for persons eating these samples in different age groups (infant, children and adult) were 112.25±16.98 μSv/y, 165.32±28.00 μSv/y and 93.65±15.25 respectively. The average of the annual effective dose found to be below the limit of (1.0 mSv/y) that is the value that suggested by the International Commission on radiological Protection. In general, it is complete that foodstuffs that were analyzed are safe for human consumption as a result of their natural radioactivity levels are under the utmost permissible level. Natural radioactivity, Canned food, Frozen chicken, Iraq food. Radioactivity is found in all foodstuffs. Recent reports have made the general public aware of this and most of people do not understand radioactivity and risk . Every type of food has some a small percentage of radioactivities. Some common radionuclides in food are potassium-40, uranium-238 and Thourium-232 . In global scale, radionuclides in food are coming from the fallout that included in biosphere. These radionuclides found in soil, plants and water, contaminate the environment. Transference occurs among the three primary components: vegetation, soil and water . Radioactivity can enter the body through ingestion, inhalation, absorption or injection of the food and nutrients. It may be ingested as the result of ingestion plants and animals or drinking water. Following a major contamination incident, all potential pathways of internal exposure should be considered . The food taken by animal can be contaminated by the deposit of natural radioactive materials falling on that from the air or through rain water. When radioactive substances in the plume are deposited on plants, soil or water, it possible then those they enter food chain. To illustrate, plants and animals surface could be contaminated by tissue contamination after either inhalation or after the ingestion of radiologically contaminated nutrients. In turn, this tissue contamination will be reduced throughout time . The aim of the present work was to identify the activity levels of different samples of frozen chicken, a part of national food in Iraq, since the primary factors contributing to the Effective dose is due to ingestion in human organs might be contaminated by this type of food. Therefore determining baseline intake levels in food the use of a diet, giving a radionuclide control is an important means of protection. For this purpose the maximum and least activity measurements have been made in frozen chicken. The samples consisted of ten of frozen chicken samples were collected from various local market in Al-Najaf city, Iraq. Frozen chicken samples were divided into groups, as shown in Table 1, and the cursor in front of each sample represent, trade name, sample code and the origin sampling. After the frozen chicken samples were collected, the natural radioactivity level was measured directly without heating, where the parts that are not valid for human uses were removed. For example, this includes the bones. The samples were cut into small pieces using electric mincer to ensure the homogeneity and then weighed by 0.750 kg each one. Then the food samples were packed into one liter Marinelli beakers (polyethylene plastic) of constant volume to ensure geometric homogeneity around NaI(Tl) detector. The measurements were done by gamma spectrometry systems from ORTEC, furnished with scintillation detector NaI(Tl) of (3"×3") crystal dimensions that has resolution of (7.9 %) at Cesium-137 (661.7 keV). The detector was protected by a 10cm thick shield of lead to decrease the radiation background , and in addition for the previous shield another 0.3 cm copper layer to weaken x-rays that may escape the lead shield . The detector was linked to standard electronics and the spectra were gathered in MCA (ORTEC -Digi Base, contains a 4096 channel connecting). The detector was energy of calibration was done and the gamma ray standard sources made in the same from (marinelli beaker) as the analyzed samples. The capacity calibration was done and the curves were acquired by befitting the experimental efficiencies for each sample density. The back ground spectra are continually measured under the same circumstances as the specimens measurements and applied to validate the calculated sample activities . The normal counting time is 86400 seconds (24 hour) for every sample, to make sure a well statistical significance. The radiation background spectra is continually measured under the same influences as the specimens measurements and used to validate the calculated sample activities. The normal counting time is 86400 seconds for every sample, to guarantee a good statistical significance . The spectra is analyzed by computers with no connection to the net ( off-line )by the use of MAESTRO-32 program which can be obtained from ORTEC which contain peak search nuclide identification , and activity and uncertainty calculation program me . Figure (1) as displayed NaI(Tl) detector which can be bought from ORTEC and the steps applied to this research . The specific activity measurement is conceivable with perfect resolution power at elevated energy levels like that was seen in the existing outcomes of gamma rays released by the progenies of every one of 226Ra and 232Th, that were in a secular balance or equilibrium with them, while , 40K was valued immediately by its gamma-line of 1460.8 KeV. For this reason, the specific activity of 226Ra was calculated by using the gamma-lines 1765 KeV (214Bi). The identical outcomes of 232Th were decided by the use the gamma-ray lines 2614 KeV(208Tl). Figure 1. The experimental setting of NaI(Tl) detector system. where (N-No) is the net area under photo peak of sample, Iγ is the probability of gamma photons per disintegration, ε is the efficiency detector at the specific gamma-ray energy, m is the weight of the measured sample in kilogram (kg) and t is the time for collecting the spectrum for the sample. Annual effective dose is a useful term that enables the radiation doses from different radionuclides and from different sources of radioactivity to be estimated. Estimates of the radiation induced health effects which would associate with radionuclides intake into the body are proportional to the total dose delivered by the radionuclides into the various organs. Radiation doses are obtained by measuring radionuclide activity in foodstuffs (Bq/kg) and then by multiplying these by the masses of food consumed over a period of time in unit of kg/y. In this study, annual intake was 50, 35 and 15 in unit kg/y for Adults, Children (old 10 year) and Infants respectively by UNSCEAR 1998 . A dose conversion factor (Sv/Bq) can then be applied to give an estimate of ingestion dose. Thus, the ingested dose is given [11,12]. Where DCF is the standard dose conversion factor for 226Ra, 232Th and 40K at different age group such as adults, children (old 10 year) and infants, as shown in Table 2. 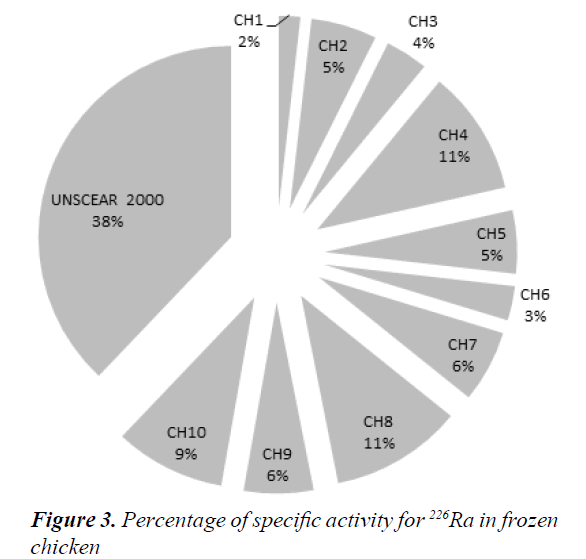 The natural radioactivity in frozen chicken samples shown in Table 3. The results of radionuclides in frozen chicken samples were obtained using gamma spectrometry systems. Table 4 illustrates the specific activity of 40K, 226Ra and 232Th in samples under study. From data obtained in Table 4, the specific activity levels of 40K were ranged from 18.95 ± 1.14 Bq/kg in KAFEL sample (CH1) to 116.83 ± 2.91 Bq/kg in KOCH FOODS sample (CH8), with an average 65.40 ± 11.14 Bq/kg. Also, the same Table 4 shows that the specific activity for 226Ra were ranged from 0.85 ± 0.25 Bq/kg in SHEMAL sample (CH2) to 8.58 ± 0.72 Bq/kg in MAGAN sample (CH7), with an average 4.53 ± 0.89 Bq/ kg. While for 232Th was ranged from 0.28 ± 0.06 Bq/kg in BARAKAT AL.BAQIE sample (CH6) to 2.12 ± 0.19 Bq/ kg in GARIP sample (CH4),with an average 0.87 ± 0.19 Bq/kg, as shown in Table 3. The differences are significant in all samples in these values of specific activities in frozen chicken samples due to geochemical composition and origin of soil cultivation kinds in this location which it is eating of chicken samples under study (These differences are attributable to soil for cultivation type in this location which is taken of feeds consumption by chicken samples). The results of specific activity in natural radioactivity for the collected frozen chicken samples under study were lower than the world median according toUNSCEAR 2000  which are 32 Bq/kg, 30 Bq/kg and 400 Bq/kg for Radium-226, Thouruim-232 and Potasium-40 respectively, as shown in Figures 2-4. Also, it can be seen the Table 4 and Figure 5, the average value of specific activity for Radium-226 level is higher than Thorium-232 in all samples. It is also noticed that the specific activity of 40K exceeds markedly the values of each 226Ra and 232Th, as it is that the most abundant radioactive element among other element. Furthermore, the excessive use of potassium containing fertilizers in the adjacent to the sampling sites might contribute to the upper values of 40K activity. Figure 2. 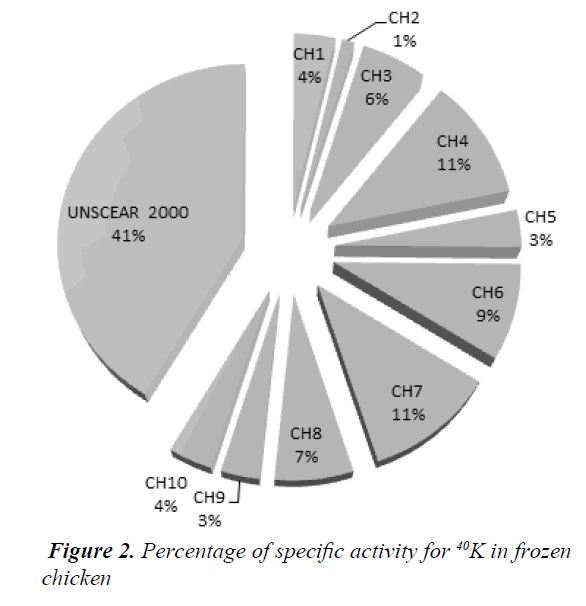 Percentage of specific activity for 40K in frozen chicken. Raeq and Hin have been determined for various samples of frozen chicken as shown in Table 4. The values of Raeq and Hin were ranged from 40.9 Bq/kg to 20.15 Bq/ kg with an average 10.80 ± 1.56 Bq/kg and 0.017 to 0.077 with an average 0.041 ± 0.006, respectively. The values for the Raeq and Hin were lower than the value of world permissible of 370 Bq/kg  and unity  respectively. Tables 5-7 show annual effective doses due to frozen chicken consumption by adults, children (10 years old) and infants respectively which it calculated using equation (4). From Table 5 it is found that, the total annual effective for adults were ranged from 33.76 μSv/y to 178.65 μSv/y with an average 93.65 ± 15.25 μSv/y. From Table 6 it is found that, the total annual effective for children were ranged from 53.66 μSv/y to 311.77 μSv/y with an average 165.32 ± 28.00 μSv/y. From Table 6 it is found that, the total annual effective for children were ranged from 51.18 μSv/y to 207.59 μSv/y with an average 112.25 ± 16.98 μSv/y. Results of AED as shown in Figure 6, it is found that the annual effective doses of frozen chicken consumption by children (10 years old) is larger than the dose from consumption by infants and adults. This biggest value for infants is due to the high sensitivity of tissues of children (10 years old) body. The indicate that the AED altogether frozen chicken samples was below the permissible limit of 1mSv suggested by ICRP " International Commission on tomography Protection", as shows in Figure 6. Figure 5. 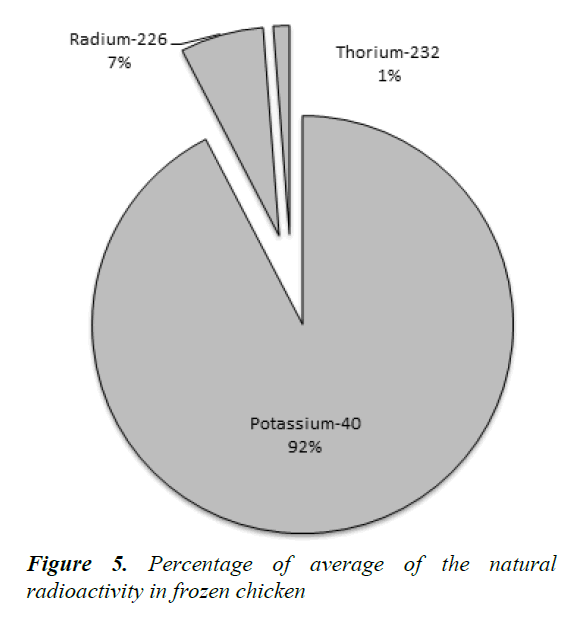 Percentage of average of the natural radioactivity in frozen chicken. Figure 6. 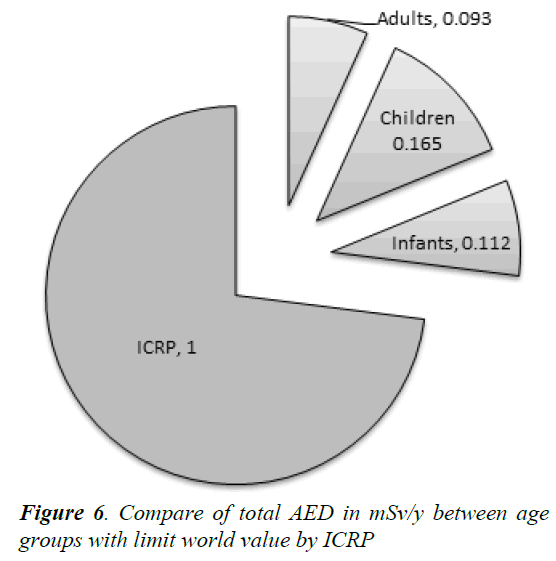 Compare of total AED in mSv/y between age groups with limit world value by ICRP. The values of specific activity (A) of 214Bi (238U series), 208Tl (232Th series) and 40K in all samples of frozen chicken found to be less than the globe average allowed by UNSEAR 2000. The values for the radium equivalent activity (Raeq) are found to be within the world average allowed value of 370 Bq/kg. Also, it is found that the values of internal hazard indices are lower than the global permissible value of unity. Afterwards assessed radiological parameters show that the overall value of annual effective dose (AED) in samples under study at different age groups are found to be below the limit of ICRP report, which is the value recommended by the International Commission on Radiological Protection, for the general public. IAEA. A Guidebook, Technical Reports Series No. 295, IAEA, Vienna. 1989. Eisenbud M, Gesell T. Environmental radioactivity from natural, industrial and military sources. Academic Press, Inc. 1997. Ritchie JC, Mchenry JR. Application of radioactive fallout Cesium-137 for measuring soil erosion and sediment accumulation rates and patterns. J Environ Qual 1990; 19: 215-233. ICRP. The 2007 recommendations of the international commission on radiological protection. 2012; 37: 2-4. The Government of the Hong Kong Special Administrative Region. Radiation and Food Safety. 2013. Kareem AA, Hady HN, Abojassim AA. Measurement of natural radioactivity in selected samples of medical plants in Iraq. Int J Phys Sci 2016; 11: 178-182. Abojassim AA. Study of norm and some radiological parameters in instant noodles sold in Iraq. World Appl Sci J 2014; 33: 974-979. Abojassim AA, Al-Gazaly HH, Kadhim SH. Estimated the radiation hazard indices and ingestion effective dose in wheat flour samples of Iraq markets. International Journal of Food Contamination 2014; 1: 1-5. Abojassim AA, Dahir DM, Al-Aboodi AS, et al. Annual effective dose of gamma emitters in adults and children for some types of rice consumed in Iraq. J Food Prot 2016; 79: 2174-2178. UNSCEAR. Sources and Effects of Ionizing Radiation. United Nations Scientific Committee on the Effect of Atomic Radiation, United Nations, New York 1988. ICRP. Dose Coefficient for Intakes of Radionuclides by Workers. ICRP Pub No. 68. Pergamon Press, Oxford1994. Pulhani VA, Dafauti S, Hegde AG, et al. Uptake and distribution of natural radioactivity in wheat plants from soil. J Environ Radioact 2005; 79: 331-346. Abojassim AA, Al-Alasadi LA, Shitake AR, et al. Assessment of effective dose due to ingestion for natural radioactivity of gamma emitters in biscuit samples in Iraq. J Food Prot 2015; 78: 1766-1769. UNSCEAR. Sources, effects and risks of ionizing radiation, Report to the general assembly, New York, USA. 2000. Organization for economic cooperation and Development (OECD). Exposure to radiation from the natural radioactivity in building materials. Report by a group experts of the OECD nuclear energy agency, Paris, France 1979. ICRP. Age dependent doses to the members of the public from intake of radionuclides - Part 5 compilation of ingestion and inhalation coefficients. ICRP Publication 1995; 26: 1-32.